The Edgewood Concert Choir and the Introduction Choir have been invited by Ohio State Representative Candice Keller to perform at the Ohio Statehouse, in Columbus, The performance will take place on Thursday, December 13 from Noon- 1:00 p.m.. Edgewood is only one of ten school districts participating this year’s holiday performance schedule. 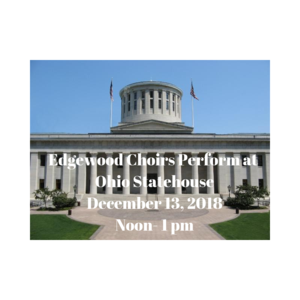 This is the first time Edgewood has been given the opportunity to perform at the statehouse. Libby Wolf, Edgewood High School Vocal Music Teacher said, “This is very exciting for us! Our choral program is growing and this opportunity will give our students the chance to shine outside of their seasonal concerts”.